Rome, National Gallery, F.N. 19217. Restored in 1953 (see Carpegna below). PROVENANCE: Morelli. Hertz. From the Palazzo Venezia and the Palazzo Corsini. J. B. Richter, La Collezione Hertz e gli affreschi di Giulio Romano nel Palazzo Zuccari, Rome, 1928, 53, as by Fra Paolino. Berenson, 1932, 417, as Fra Paolino?, early. Nolfo di Carpegna (editor), Catalogue of the National Gallery, Barberini Palace, Rome, Rome, 1954, 47-48, Pl. 41 (1957, 49), as not by Fra Paolino, but from the circle of Fra Bartolommeo and Albertinelli in the second decade of the sixteenth century. Zeri, 1962, 225, 227, 230, 231, Figs. 13-14, as by the Master of the Kress Landscapes. Berenson, 1963, I, 165, as Fra Paolino. Carroll, 1964, (1976), I, Bk. II, 1-73, 85-91, P. 2, II, Bk. III, Fig. 4, as Rosso, around 1513; “Addition to the Preface,” 1976, vii, as not by Rosso. Dal Poggetto, 1969, 16, as by the Master of the Kress Landscapes. Wilmes, 1985, 84, as not by Rosso and refers to Zeri’s attribution to the Master of the Kress Landscapes. Franklin, 1994, 81, as not by Rosso. Ciardi, 1994, 58, as not by Rosso. Capretti, 1996, noted Zeri’s attribution and its former attribution to Fra Paolino. Waldman, 1998, 464, included this painting in Zeri’s group, however identifying the artist as Giovanni Larciani. Zeri associated the painting with his Master of the Kress Landscapes. 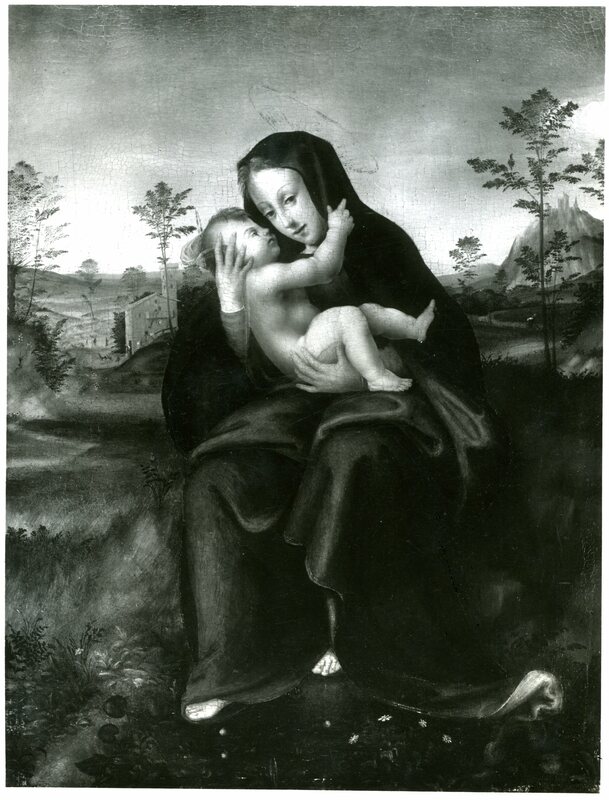 But it is also especially close to the Madonna and Child at Bucknell (Fig.RP.11), which he did not consider but which Freedberg thought, by implication, was related to this group. They are almost certainly by the same artist, as is evident in the similarities of the heads of the Madonna and of the children, and in the landscape details. 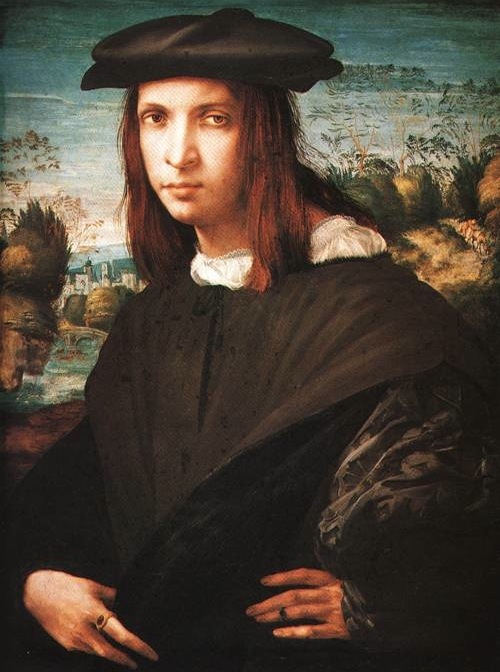 Borgo thought the Bucknell painting was by Albertinelli and an assistant. 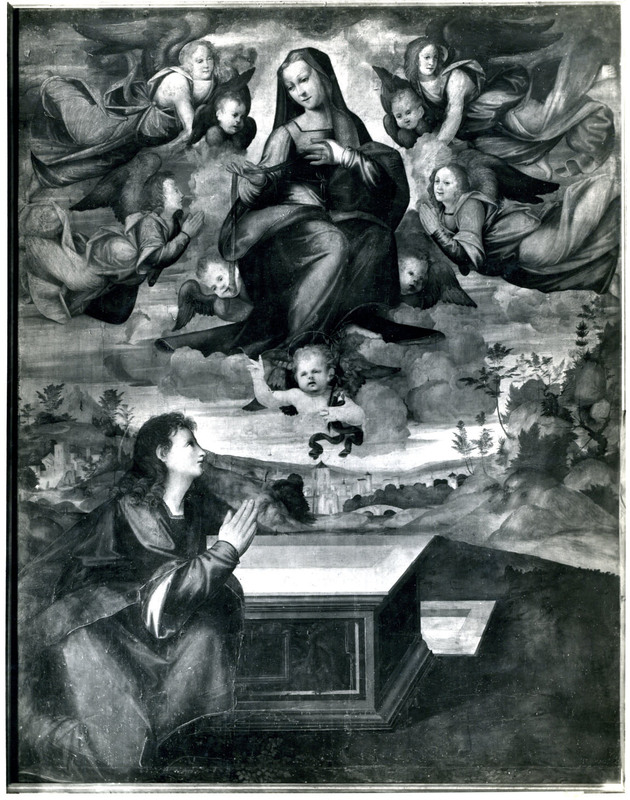 That assistant may well be the author of the Assumption of the Virgin with Saint Thomas. 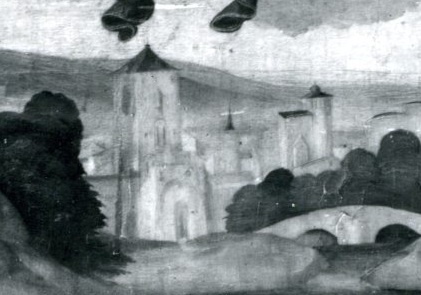 A section of the buildings in the background just below the Virgin is very similar to part of the group of buildings in the background of the Portrait of a Young Man in Berlin (Fig.RP.2a) that has been attributed to Rosso.